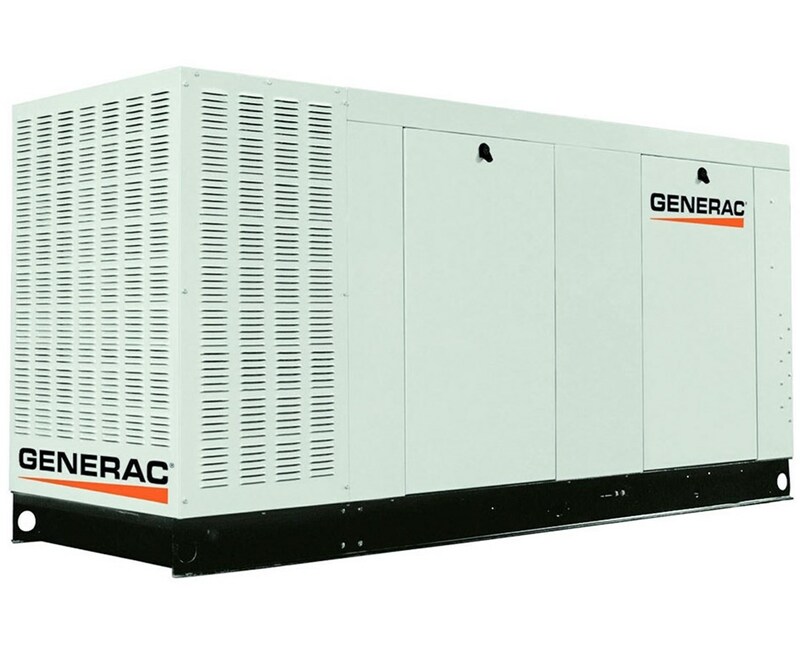 The Generac Protector Series 70-150kW Liquid-Cooled Generator is a powerful backup electrical system that effectively provides high power nodes that are perfect for large appliances. Featuring a V-type Generac engine, it offers a displacement of 5,400cc and engine parameters up to 3,600 rated synchronous rpm. 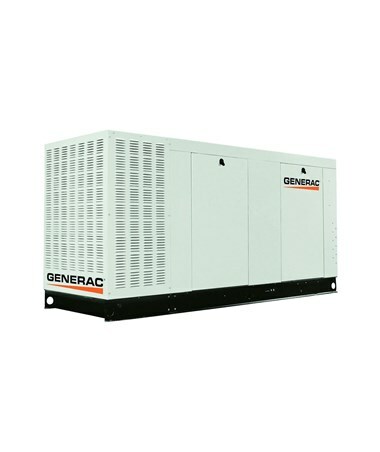 This Generac generator uses both natural gas and propane vapor fuel to operate. The Generac Protector Series generator boasts the top-class regulation system that features a single-phase sensing and a ±1% electronic voltage regulation, which provides a fast and safe response to changes in load. Provided with a liquid-cooled engine, it uses a belt-driven pump and offers a fan speed of up to 2,200 rotations per minute (RPM). The Protector Series also features a low-oil pressure shutdown for added safety. This Generac generator uses a simple 2-line plain text LCD display interface that allows homeowners or office personnel to easily operate the generator. It is housed in an aluminum enclosure that protects the power generator from weather and corrosion. In addition, this Generac liquid-cooled generator is UL 2200 listed for safety and operational purposes. Please Note: The QT07068X and QT08054X Models are not for sale in California and Massachusetts. The Generac Protector Series 70-150kW Liquid-Cooled Generator offers six varying features that suit your needs. Please select your preference from the drop-down menu above. UL. The Underwriters Laboratories Inc. (UL) is the leading and trusted product safety accreditor in the United States. UL is recognized as the organization for health and safety testing of machines and other industrial equipment. CUL. The Canadian Electrical Code (CUL) certification ensures that the equipment has been tested thoroughly and has passed the requirements issued by the CSA or Canadian Standards Association. EPA. The United States Environmental Protection Agency (EPA or USEPA) is from the federal government of the United States which regulates and ensures the protection of both human health and the environment. SCAQMD. The South Coast Air Quality Management District is one of the trusted air quality regulatory agencies in California which control air pollutants in the South Coast Air Basin (SCAB) area and other parts of the United States.